<< Reg in Nottingham during the latter part of World War II, where he met Sheila's aunt, while he was working there in the ambulance/casualty service. Jim writes about POCOMOTO by 'Rex Dixon'. If you want to discuss these and other series books, we suggest you join our COLLECTING BOOKS and MAGAZINES FACEBOOK GROUP. FOR SALE, about a dozen KEMLO hardbacks without jackets. 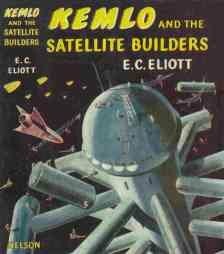 Kemlo and his friends live on Satellite Belt K, a giant wheel spinning in orbit around Earth. The boys, born in space, require no helmets and thus can't survive in any type of atmosphere without special apparatus. This series of books was, and is, unique for that reason. 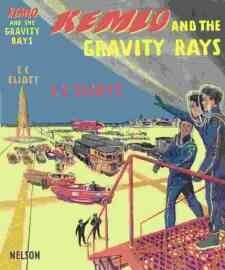 E C Eliott also wrote two TAS books, set in Australia on the Woomera rocket range. Famous EAGLE artist, A Bruce Cornwell, illustrated both TA books and most of the KEMLO books, up until at least ZOMBIE MEN. SPACE INVADERS was illustrated by George Craig, although by then the lovely coloured frontispiece had been replaced by a B/W line drawing. Michael answers: " According to The Encyclopaedia of Science Fiction by John Clute and Peter Nicholls (St. Martin's Press, New York, 2nd edition, 1993 - p. 375), the author's real name was Reginald Alec Martin, and he was born in 1900. I am aware of only four titles that came out in paperback: Kemlo and the Zones of Silence, Kemlo and the Star Men, Kemlo and the Space Lanes, and Kemlo and the Martian Ghosts. Did any other titles come out in paperback?" also " Merlin paperback editions spell the name Eliot". also "A flip through the books shows that almost all the characters' names begin with K - certainly the main characters: Kemlo, Kartin, Kerowski, Krillie, and so on. My impression is vague, but it appears that there were different zones in outer space colonized by humans, referred to as Satellite Belts. These had letter names, and everyone in a particular Belt had a name beginning with the appropriate letter of the alphabet. Thus you had Belts K, S, M, T, and O (and possibly others - those were what I could find just now when I looked at the few books I have), and because the main action of the books was set in Belt K, the characters' names all began with K, and I presume the same would apply to the other Satellite Belts, too. I could find no evidence of anyone having surnames at all, but that may not mean much, because it is quite common in children's books not to mention surnames anyway. There seems no ground to assume any special reason why the author chose the name KEMLO for his main character. For that matter, why did he choose Kerowski, Kartin, and so on? Reading your British 1950 series [page]... I see that you are interested in whether Reginald Alec Martin is still alive. / I can answer that. He was my aunt's fiancé from wartime in the 40's until his death from cancer in Sussex in 1971. Besides writing under the name of E.C.Elliot he also wrote under the name of Rex Dixon - The Pocomoto series (about cowboys) and Robert Martin. His fiancée, my aunt had the entire collection of his books, all autographed to her personally. / In later years he wrote books for others under their own names - eg I believe Gary Sobers was one of these .......from the top of my head. 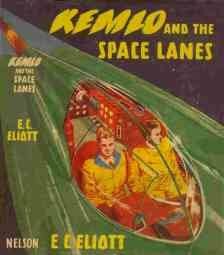 As a young child I remember going to my public children's library in Sheffield in England and reading most of the Kemlo books which at the time I enjoyed even though I knew that the science behind them was mostly wrong. I wrote an email to the Sheila on your webpage and confirmed that the name of the woman was indeed her aunt. At least we now know where four of those book have ended up! 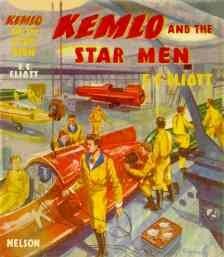 I recall enjoying two Kemlo books at my school library; ‘Kemlo and the Space Men’ and ‘Kemlo and the Satellite Builders’. The cover of ‘Builders’ was not as you have it there but was definitely the artwork on your “Masters of Space’ dust jacket. There may have been some migration of artwork between editions. I remember the odd ‘square’ space station. Even as a 7-8 year old, I thought that the space youngsters not needing breathing air was a bit rich. I enjoyed ‘Tas and the Space Machine’ and have a copy today (sans dust jacket). 12. Kemlo and the Space Men 1959 Thanks, Peter. See below. * Merlin paperbacks spell the author's name 'Eliot'. There is a 'Kemlo List' on Yahoogroups for those interested in the genealogical history of the 'Kemlo' surname. Update: the list owner has since passed away. Thanks to Peter, Shelia, Sandy M, Michael E, Jim M and Mike C for additional information and scans on KEMLO. Between 1953 and 1963 Rex Dixon produced 23 full-length Pocomoto stories for the publishers Thomas Nelson & Sons. Each book was a hardbackedition of between 206 to 214 pages with a handsome dust-jacket and a colour frontispiece. In 1967 Paul Hamlyn Publishers began to reissue some of the series in a 126 page paperback version. A few were also published by Nelson in their Nelson Juniors paperback series. 1. Pocomoto-Pony Express Rider ... Illustrated by Jack Harman... Nelson 1953. .
2. Pocomoto-Tenderfoot ... Illustrated by Jack Harman.. Nelson 1953. 3. Pocomoto-Bronco Buster ... Illustrated by Jack Harman.. Nelson 1953..
4. Pocomoto and the Night Riders ... Illustrated by Jack Harman.. Nelson 1953. 5. Pocomoto and the Canyon Treasure, Nelson 1954. 6. Pocomoto-Brush Popper ... Illustrated by Jack Harman.. Nelson 1954. 7. Pocomoto and the Li'l Fella ... Illustrated by Jack Harman Nelson 1954. .
8. Pocomoto-Buffalo Hunter ... Illustrated by Jack Harman.. Nelson 1954. 9. Pocomoto-Cowboy Cavalier, Nelson 1955. 10. Pocomoto and the Lazy River ... Illustrated by Jack Harman.. Nelson 1955. 11. Pocomoto and the Snow Wolf ... Illustrated by Jack Harman... Nelson , 1955. .
12. Pocomoto and the Indian Trails ... Illustrated by Jack Harman.. Nelson, 1956. 13. Pocomoto and the Robbers' Trail ... Illustrated by Jack Harman.. Nelson 1956. 14. Pocomoto and the Spanish Steed ... Illustrated by Eric Tansley. .Nelson 1957. .
15. Pocomoto and the Desert Gold ... Illustrated by Robert Hodgson. Nelson 1957..
16. Pocomoto and the Circus Folk ... Illustrated by Robert Hodgson.. Nelson 1957..
17. Pocomoto and the Texas Pioneers ... Illustrated by Robert Hodgson.. Nelson 1958. 18. Pocomoto and the Lazy Sheriff ... Illustrated by Robert Hodgson.. Nelson 1958. 19.Pocomoto and the Lost Hunters ... Illustrated by Robert Hodgson.. Nelson 1959. 20. Pocomoto and the Texas Ranger ... Illustrated by Robert Hodgson.. Nelson 1960. 21.Pocomoto and the Golden Herd ... Illustrated by Robert Hodgson.. Nelson 1960. 22.Pocomoto and the Warrior Braves ... Illustrated by Robert Hodgson.. Nelson 1961. 23. Pocomoto and the Mexican Bandits, Nelson 1963. A Book of Highwaymen ... Illustrated by Robert Hodgson.. Nelson 1963. A Book of Pirates ... Illustrated by Robert Hodgson. Nelson 1962. The boy who comes to be called Pocomoto is the sole survivor of a wagon train massacre by hostile indians. Two old prospectors called Hap and Seb find him hidden amongst a clump of trees crying out for food. They called him Poco because that is the Spanish for small and he was just a baby when found. A clump of trees is called a motte and so, first of all, be became Poco Motte which Seb says means a little lost fella found among the trees. Over time Poco Motte gets changed into Pocomoto. The two old-timers with the help of an occasional frontier woman bring up the boy according to the rules of life that they have lived by. Most of their time is spent in desert camps well away from civilization and Pocomoto grows up to be a strong, self-reliant and honest young boy. Eventually Seb decides that Pocomoto needs to be given a chance to learn how to live in a settled community and become civilised. The Reverend Dan Martin and his wife Linda agree to adopt him and bring him up with their two daughters in the south western town of Yakima City. It is difficult for Poco to fit in at school and Dan and Linda decide to give him lessons themselves for a while. Poco finds it hard to adjust to sleeping indoors and encounters difficulties in forming friendships with boys of his own age. Gradually, however, he learns how to maintain the values of the old prospectors whilst learning to respect and love his new family. Hap dies and Seb strikes it rich and moves back east for a while, though in some of the adventures he returns to wander in the wildernesses once more. Most of the above information is printed on the back panel of each of the Nelson dust-wrappers or revealed to the young reader as he encounters the first few chapters of each book. Some of the stories are based in the town of Yakima City but mostly it is an open air life with many hardships that is presented to those who read the books. After reading several Pocomoto adventures four groups of characters begin to emerge as the key personalities in the young boys development. First, and perhaps most important, there is the love and respect that is felt between Poco and his adopted family. Dan Martins control is firm and just and he encourages Pocomoto to develop the habit of thinking deeply about right and wrong before taking any action. He encourages a sense of courtesy and fairness and applauds the way that Poco sticks up for his friends when they are in trouble. Even Tess, Dans eldest daughter, begins to accept him as a proper member of the family and Poco finds that he likes her because he finds her company restful for she was not given to chattering like other girls he knew. When Tess gets to go on the expedition brush-popping with him Poco decides that he is pleased that she is to come. By the end of the expedition they are firm friends. The young boys of his own age are at first a puzzle to Poco. In so many ways he is older, wiser and more independent than they are. However, little by little the barriers come down and he learns which boys in Yakima City are to be trusted and respected even if they do behave foolishly sometimes. He decides in the end that he has three special friends, each of them like himself with a particular problem in their lives. Willie Sharpe, the youngest, is torn between a mother who likes town life and a father who wants to stay out on his ranch all the time. Lance, whose grandfather was a Cherokee Indian, faces the struggle about his true identity. Tim Bladen is the Sheriffs son and seems to be treated with extreme harshness by his strongly disciplined father. It is Tim who proves the most interesting of these companions for his patterns of thought are so radically different from Pocomotos that conversations and arguments between them on their long journeys fall into a stimulating pattern. Tim is prosaic and down-to-earth. Give it to us straight, is his constant demand when Pocomoto starts to use his imagination to solve a particular problem. Tim can read a trail almost as well as Pocomoto but he cant project his thoughts forward and work out what the trail means. The third important set of characters is to be found amongst the animals with whom Pocomoto has to deal. In particular there is his horse, Goldflash the palomino, whom he caught and broke to the saddle himself. Their relationship is portrayed as more that of a loving friendship than that of a master and servant. More unpredictable is Horace the burro, a cantankerous creature with a strong instinct for survival. Goldflash might stray into an area of quicksand but Horace would never do so. Indeed Horace seems to be able to predict future trouble for he sometimes delays Pocomotos journeys in a way that proves to be ultimately beneficial to both burro and boy. This happens on the occasion when he seems to have purposely stalled their progress until a dangerous river in full spate has subsided to a safe level. Horace also has a compulsive desire to eat beans that leads him into all sorts of amusing mischief. The most important characters, however, are those adult individuals of the Wild West that show a rugged independence and determination that the author clearly admires. Seb, the man that rescued him in the wilderness, is clearly one of these people and the man who develops in Pocomoto the respect for the outsider that permeates each of the stories. Such men as Snowbait, the ranch foreman, Laredo, the Pony Express Rider and Silver Pete , the old prospector, each have something to contribute to the growth to manhood of the young foundling. Without being dull and sober each Pocomoto is strongly moral in purpose with certain messages being repeated again and again in a surprising variety of ways. The younger reader would learn that you should never desert your friends, you should never undertake a job without making thorough preparations; that growsing never gets a job done, that first impressions are not always to be trusted and that not everybody wants to lead their life in the way that you do. A brief closer look at one of the Pocomoto series will reveal the other qualities of Rex Dixons writing about the Wild West..
Their thoughts are interrupted by that old stand-by of western stories and western films  the runaway stagecoach. It will come as no surprise to learn that Pocomoto on Goldflash is the one to save the situation by bringing the stagecoach successfully to a standstill. However, what is extraordinary is the wealth of convincing detail about both the stagecoach and the method of slowing it down and stopping it that the author manages to find. All the correct names, all the details about how things work and finally how the horses contribute to the task of pulling and steering the coach, are laid out in this and succeeding paragraphs. It is the same with everything he describes in this and other books  how to make an impromptu shovel out of tree bark; how to force cattle out clusters of cactus; how to break a horse to riding without breaking its spirit, and a myriad of other jobs we associate with visions of the West. They are all done with both gusto and absolute conviction. He never retreats into vagueness nor evasion yet also never persists into tedious over-writing. Whatever his real background you are carried along by the idea that he knows exactly what he is talking about. You trust Rex Dixon to give you a straight vision of the way things were. After the stagecoach incident where Poco and Tim discover that the horses were spooked by a stray shot which creased and disabled the driver, the author shows his capacity for glorious unpredictability. Just why anyone would shoot at the driver of a stage carrying passengers but no valuables is the question that has to be posed. The answer when it comes is very surprising. After they begin their journey into the Pecos Poco and Tim cross the tracks of a mysterious stranger and then late one night he blunders uninvited into their camp. The story of Lancelot Sebastian Montmorency immediately takes the ideas of the boys in a different direction and the whole incident of the stage-coach has to be re-appraised. Stringbean, as the stranger insists on being called, is one of those mysterious men whose stories can only be pried out of them by a sympathetic listener. He has come to the Pecos with a map and a letter from his dead father and immediately the boys are intrigued by the possibilities of what they might find. A slight diversion from their route will take them to the area covered by the map and perhaps lead them to something precious. The three agree to travel together deeper into the Pecos. The story has only one more character to be added to the mixture. Many of the Pocomoto stories are like this with Poco either alone or with a few companions pitted against the demands of the mountains and the desert. The details of survival and journeying through such hostile territory are constantly being brought before us in the story-line. The final character is Silver Pete. The story is built nicely to a climax with a terrific sandstorm that engulfs the men, the horses and Horace the burro. You can almost feel the sand stinging into your eyes, choking down your throat and burying you in a make-shift grave. When the storm is over Pocomoto finds that he is the only one of the three uninjured and that he needs all his practical common sense and desert lore to see them through. Silver Pete proves to be an angel of mercy who had an instinct that they were in trouble and he helps them all back towards Yakima City. The moral of the story is reinforced by what Stringbean decides to do with bags of gold bequeathed to him by his father. He wont use it to lead a life of ease back in the east. He now feels his home is at the fertile valley on the edge of the wilderness. He intends to build a ranch and raise cattle and set about the almost impossible task of fencing off the desert from the land he can now call home. Any problems or questions? Email John. Back to Collecting Books & Magazines Main Index.